In a world where smart plugs are increasingly becoming commoditized—with mainline brands hovering around $30 and no-name plugs as cheap as 10 bucks—is there room for a $60 smart plug that’s premium-priced because, well, it has a USB charging port on its side, monitors its energy consumption, and lights up in multiple colors? It’s a tough sell, but at least the Fibaro Wall Plug with USB Charging Port does everything it claims to do without any real complaints. Fibaro's Wall Plug with USB (a less-expensive sans-USB version is in the works) has the familiar look of any number of oversized, single three-prong smart sockets. While it fits rather discreetly flush against the wall, the design has the immediate drawback that it blocks the second outlet in the socket, no matter which outlet you plug it into. If you use the Fibaro in the bottom outlet on a standard two-outlet plate, you can squeeze a two-prong plug into the upper outlet, but three-prong plugs won’t fit because of the blocked ground hole. Anything with a larger adapter is right out. Still, while you may lose an outlet, you do at least gain a USB port, which is positioned on the side of the device. That port, however, outputs just 1 amp of juice. If power consumption gets too high, you can set the switch to shut down (if you’re willing to do the math). As a Z-Wave Plus device, you’ll need a Z-Wave-compatible hub to take advantage of the plug’s smart features. While it can be used as a generic Z-Wave plug with just about any hub, certain hubs—namely Samsung’s SmartThings—have a device handler that enables more advanced features beyond simply turning it on and off via your phone. The bad news is that, at press time, the device handler had not been certified by SmartThings yet, and installing it meant following an 18-step operation of downloading driver code from GitHub and manually uploading it to my SmartThings account. This was straightforward enough for a seasoned pro, but any casual user will want to wait for that certification to be completed before purchasing the device. 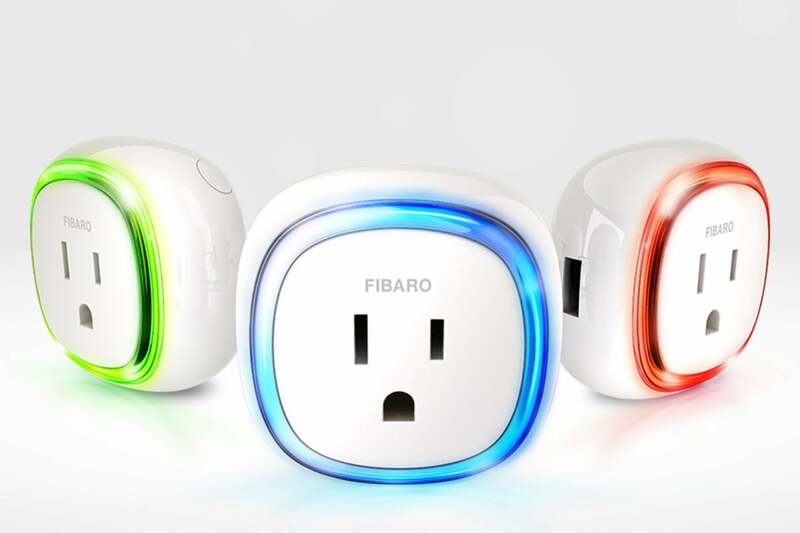 With the device handler installed, the Fibaro Wall Plug shows off the full range of its capabilities. The plug and the USB port appear as separate devices within SmartThings and can be managed independently. The bulk of the smart functions revolve around the standard socket. 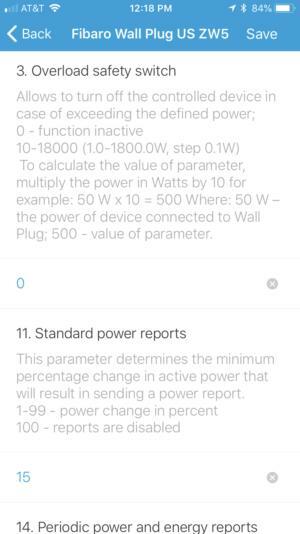 Here you’ll find an energy monitoring feature within the SmartThings app, along with settings that let you use the lighted LED ring around the socket to indicate whether the switch is off or on. The color of the ring is completely configurable, but you can start simple by setting red for off and green for on, or select from one of the five other available colors for each status. A separate mode also lets you change the ring’s brightness based on the power draw it’s experiencing: the brighter the ring, the more juice that lamp is pulling down. I didn’t find this feature very helpful or instructive in my testing, but the light ring does make for a handy nightlight. 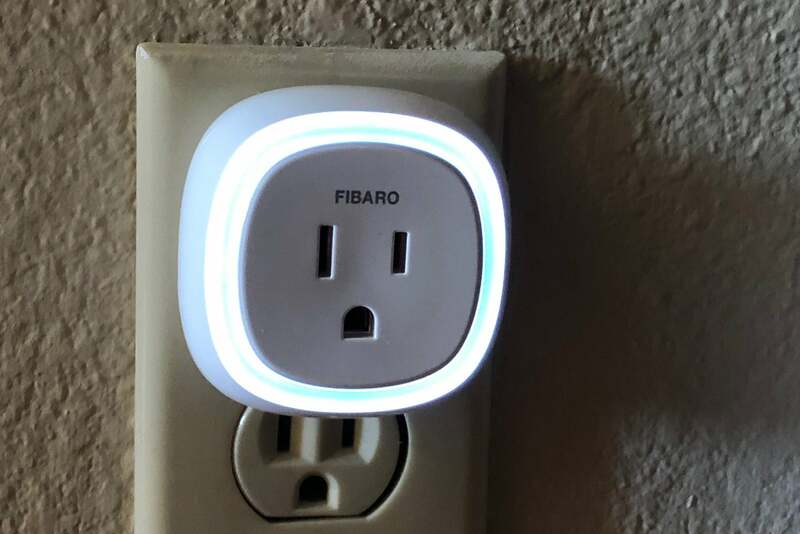 A (small) rainbow of color awaits you in the form of a programmable LED ring, but this smart plug stupidly blocks full use of the adjacent outlet. Do the features match the price tag? 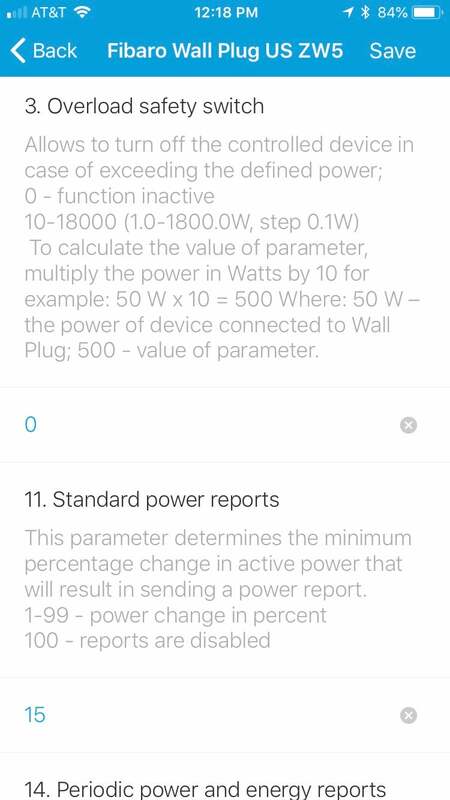 Again, the USB port appears separately within SmartThings, and while it’s not tied to the color ring, it does include a power consumption meter and can be turned off and on remotely. Both facets of the plug tie fully into the SmartThings ecosystem, so you can schedule on/off times and include the plugs in other scenes and automations. I didn’t experience significant trouble with any of this throughout my experience with the device. The biggest downside of the Fibaro Wall Plug, unfortunately, is its price. At $60, the Wall Plug squarely lands at the top end of the market. Does a flashy light ring, a USB charging port, and energy monitoring make the upgrade worthwhile? We report, you decide.